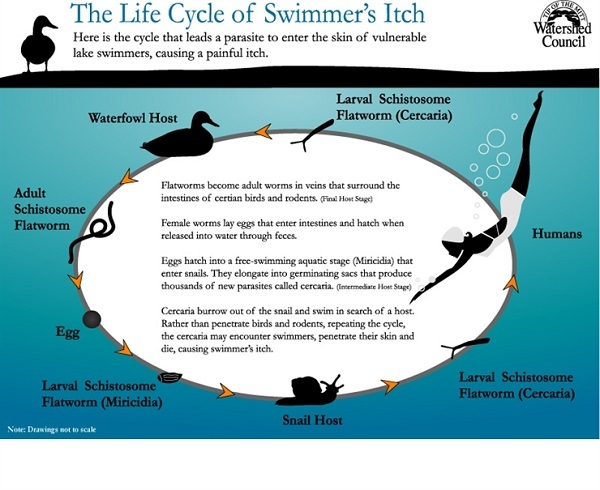 Swimmer's itch also known as duck itch, lake itch, and known scientifically as cercarial dermatitis, appears as a skin rash caused by an allergic reaction to certain microscopic parasites that infect some birds and mammals. These parasites are released from infected snails into fresh and salt water (such as lakes, ponds, and oceans). While the parasite's preferred host is the specific bird or mammal, if the parasite comes into contact with a swimmer, it burrows into the skin causing an allergic reaction and rash. Swimmer's itch is found throughout the world and is more frequent during summer months. If the larvae find one of these snails, they infect the snail, multiply and undergo further development. Infected snails release a different type of microscopic larvae into the water. This larval form then swims about searching for a suitable host to continue the life cycle. Although humans are not suitable hosts, the microscopic larvae burrow into the swimmer's skin, and may cause an allergic reaction and rash. Because these larvae cannot develop inside a human, they soon die. Be aware that swimmer's itch is not the only rash that may occur after swimming in fresh or salt water. Swimmers itch is often misdiagnosed as chiggers, poison ivy or nettles due to the way the rash looks. Read more about this here. Do I need to see my healthcare provider for treatment? Though difficult, try not to scratch. Scratching may cause the rash to become infected. If itching is severe, your healthcare provider may suggest prescription-strength lotions or creams to lessen your symptoms. 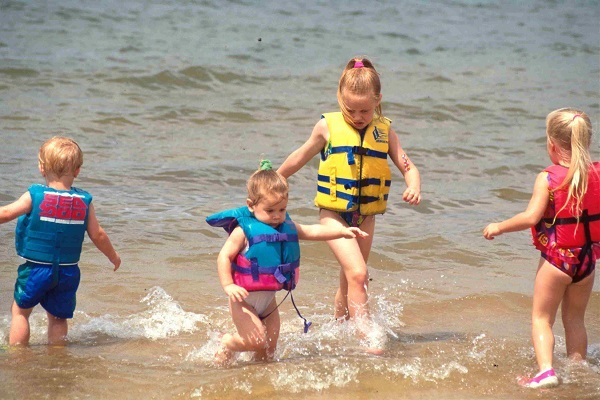 Swimmer's itch is not contagious and cannot be spread from one person to another. No. Many factors must be present for swimmer's itch to become a problem in water. Since these factors change (sometimes within a swim season), swimmer's itch will not always be a problem. However, there is no way to know how long water may be unsafe. Larvae generally survive for 24 hours once they are released from the snail. However, an infected snail will continue to produce cercariae throughout the remainder of its life. For future snails to become infected, migratory birds or mammals in the area must also be infected so the life cycle can continue. Yes. As long as your swimming pool is well maintained and chlorinated, there is no risk of swimmer's itch. The appropriate snails must be present in order for swimmer's itch to occur. 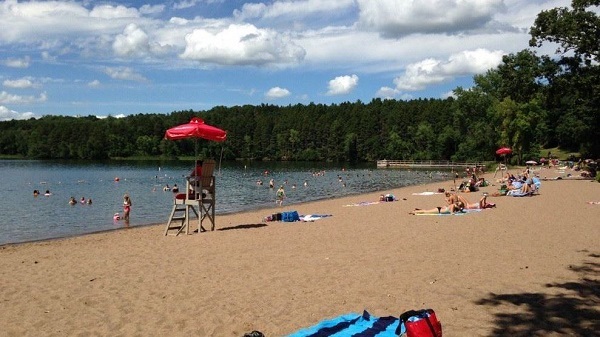 Up until now there has been no real solution for swimmers itch. There have only been products that help reduce the itchy feeling of swimmer’s itch. We FINALLY have the solution. 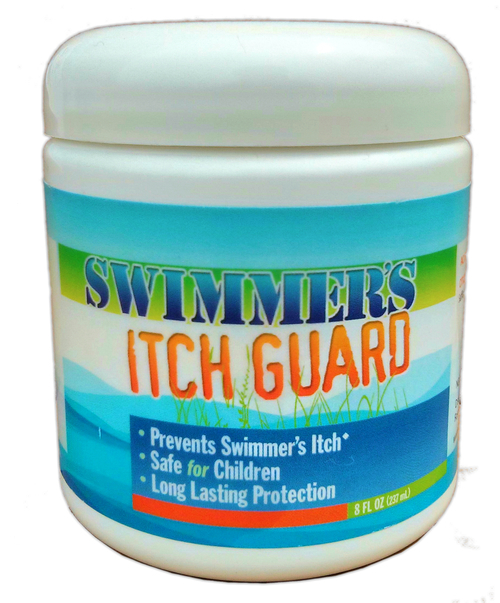 Swimmers Itch Guard is the best and only product that PREVENTS Swimmers Itch is It has been proven to work 100% of the time when applied properly. It is all natural and completely safe for children and adults. 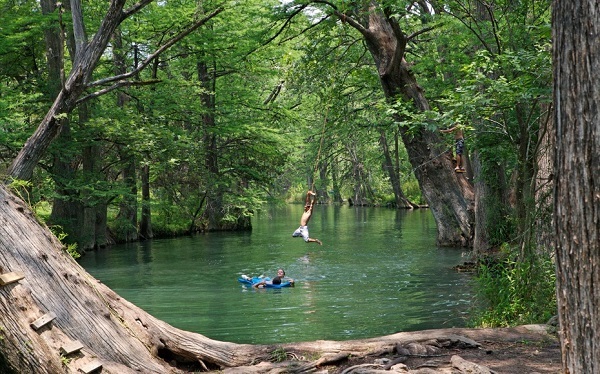 You can literally swim in a lake infested with swimmer’s itch for up to 90 minutes and be fine!